We don’t allow dogs or any pets onto the campsite. This is to minimise disruption to the local wildlife. Campfires are positively encouraged at The Secret Campsite Lewes, and we sell firewood for them. We ask everyone not to collect firewood locally as deadwood is a vital ingredient for the habitat’s health. What are the rules on music? We ask campers not to play any electronic music or radios and to keep all noise to a minimum after 10pm. We do not allow smoking in the communal areas or in any of our accommodation structures but feel free to smoke on your pitch, please just pick up the butts. For safety reasons, we ask you not to fly kites anywhere on the Lewes campsite. Can I recharge my phone or battery pack? Everyone is welcome to leave their phones, laptops and batteries at reception. We will charge them for free. Please note the Secret Campsite cannot accept responsibility for damage or theft to any equipment left with us. How do we get into Knowlands Wood next door? It’s a 5-minute walk south along the old railway track that runs through the campsite. Turn off left just before you go over a bridge that crosses a footpath and you are into Knowlands which is alive with wildlife. Where can we go boating? The Anchor Inn at Barcombe hires boats out by the hour and is incredibly popular on hot days during the summer. It is a 45-minute walk from the Campsite, across fields and through woods. How close is the nearest pub? The nearest pub is The Royal Oak in Barcombe which is a 25-30-minute walk away along a wildlife rich footpath. Where is the nearest castle to The Secret Campsite? Lewes Castle is the nearest castle to the campsite. It’s small, but perfectly formed, with views across the town and is a classic Norman castle. Check-in time is from 3pm until 6:30pm and 7pm on Fridays but if you are running late please contact us during these hours to let us know. We can then arrange a different plan for your arrival. Your pitch needs to be cleared by 11am on the day of departure. Please make sure you have settled up any outstanding tab by 11. How are the pitches different? We have 13 pitches in the main camping meadow over the bridge, 3 pitches in the disorganised orchard and 3 pitches on The Bank which is near to the buildings. The Tree Tent is in the Camping meadow, and The Gridshell is in the disorganised Orchard. If these structures are unsold a couple of days before the rental date, they become available to rent as normal camping pitches. We also have an emergency pitch for surprises. How many people can a pitch accommodate? We restrict the number of people on a pitch to 7 with no more than 4 adults and at least one adult. The aim is to keep the site peaceful and to avoid large groups. What restrictions are there on our tent size? None. The more ostentatious the better, and our large pitches can accommodate most sized tents. For the peace of other campers, we avoid groups of more than 3 families. We limit all bookings to a maximum of 2 pitches with a maximum of 4 adults and 7 people aged 3 and over per pitch. Can we book the whole site? Despite numerous requests we don’t book out the whole site. This allows us to focus on creating a fantastic habitat for wildlife which our campers can enjoy. Can we bring a caravan or motor home? Unfortunately, not. 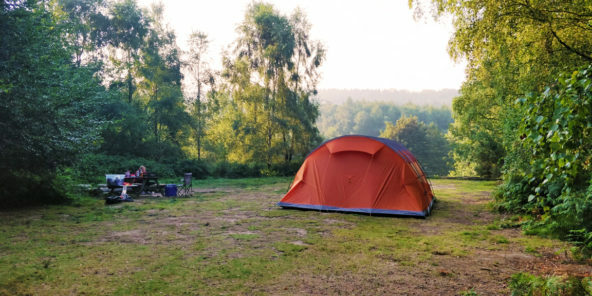 To keep the meadow quiet and safe for both families and the local wildlife, we keep all of our pitches and camping areas free from any vehicles. To preserve the relaxed and natural feel of the setting, we do not allow cars into any of the camping areas. This also makes it safer for children to roam. To transport your kit from your car, we offer various sized trolleys and wheelbarrows. Yes! We have traditional toilets, showers and a washing up area, as well as thunder box compost toilets located in the meadow for enthusiasts and night-time emergencies. You will need to bring your own toiletries. See our facilities here.